Tomorrow marks the birthday of a towering figure in American history. On, July 16, 1862 Ida B. Wells, African-American journalist, suffragist, and a leader of the early Civil Rights Movement was born in Holly Springs, Mississippi. As a suffragist, Wells founded organizations that helped black women and fought for their rights, such as the Alpha Suffrage Club of Chicago in 1913. 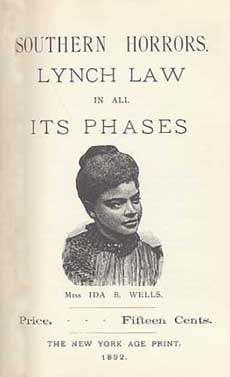 In the 1890s, Wells led an anti-lynching crusade in the US South after three of her friends, Thomas Moss, Calvin McDowell, and Henry Stewart were lynched for violating the strict social conduct codes to which blacks were subjected. Wells wrote and published articles under the pseudonym, “Lola,” to write about controversial topics at the time. Through writing, Wells attacked the prejudices and injustices of her time. Her crusade, along with countless investigative reports in various African-American journals, makes Wells one of the most prominent figures of the early Civil Rights Movement. Wells gained manumission six months after her birth when the Emancipation Proclamation was declared. Both of her parents were active in the Republican Party during Reconstruction, fomenting Wells’ interest in politics and race. James Wells, her father, helped found Shaw University, originally the Raleigh Institute, a school for freed slaves, which she later attended at the age of sixteen. She was expelled a couple months later for rebellious behaviour after confronting the college president. A little later in 1878, Wells lost her parents and youngest sibling to a yellow fever outbreak in Holly Springs, leaving her and her five remaining siblings orphans. As the oldest, she took responsibility, pursuing a job to support her family. She eventually acquired a teaching position at a school in a separate district by using her wit to convince the school board that she was eighteen and able to teach. At the segregated school, she began to gain interest in the education of blacks, realizing the significant difference in the amount of money she made as a black teacher compared to a white teacher. The turning point in Wells’ activism occurred on a train ride to Nashville in 1884, when she was asked to switch her seat to the smoking or “Jim Crow” car after purchasing a first-class ticket, despite the 1875 Civil Rights Act which banned discrimination. When she returned to Memphis, she hired attorneys to sue the railroad company, but even after winning the case, the decision was reversed by the Tennessee Supreme Court on the basis that her conduct on the train was disrupting other passengers. The incident motivated Wells to pursue writing and a career as a journalist. Between 1889 to 1923, 50 to 100 lynchings would occur each year, which peaked in 1892 with 161 African-Americans being murdered. The lynching of Well’s friends galvanized her writing and sparked a report on the mass lynchings that took place over the South. Over two months she traveled the South to collect information on various lynching cases. Her results concluded what she had expected: the majority of lynchings took place solely because black men challenged the social conduct rules they had been subjected to. Many of the lynchings had been covered under the facade that these men abused or harassed white women, of which Wells found little to no evidence. After writing all of the information in New York Age, an African-American newspaper run by T. Thomas Fortune, she was barred from going back to Memphis and threatened with death. The report helped pique the migration of blacks out of the South to the North, Midwest and West. In 1909, Wells, alongside W. E. B. Du Bois, Mary White Ovington and Moorfield Storey, cofounded the National Association for the Advancement of Colored People (NAACP), which aimed to fight for the rights of African-Americans in the US and eliminate racial hatred and prejudice. The crusader passed away on March 25, 1862 but will continue to be remembered for the work she has contributed to social justice and equality.